so stunning, Joan - love the colors you used and the stitched borders just give it that added pizzazz (not sure how to spell??) - anyway it's cool! That's beautiful. The colors you used on the flowers and background are so bright and cheerful. Love those flowers and the border dies and your bright, juicy colors! Guess I just love everything about this. Gorgeous! Love the flowers and that awesome w/c background! This is a happy card, bright and pretty!! 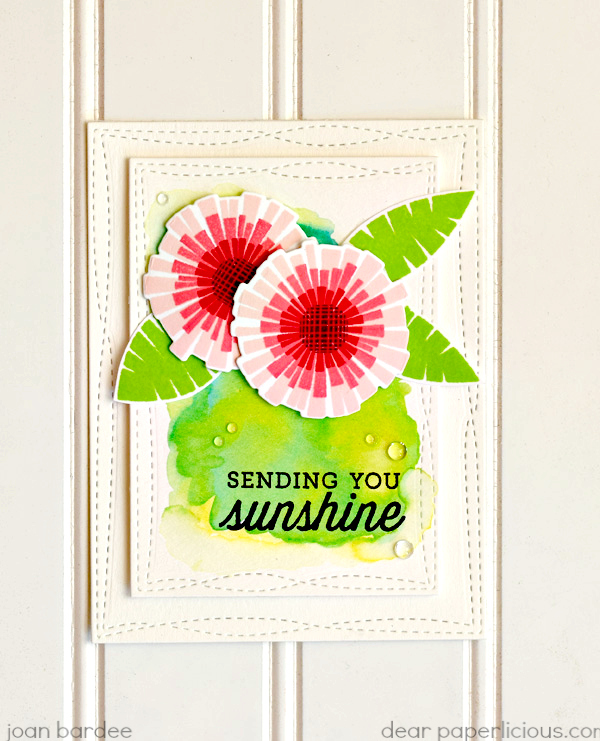 None of us will ever be Kay Miller, but your card is a marvelous tribute to her style! I love those flowers and your watercolor background! Wow--this is gorgeous! Love the colors & your background is fabulous! Ooh I love those colours and the whole freshness of your card! Gorgeous background to rest those flowers on. This is stunning - a true piece of art! TFS! I love it!